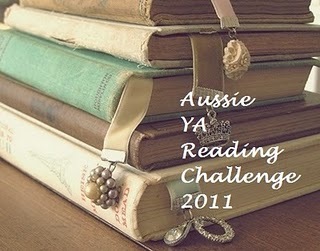 Australian participants – Read at least 12 young adult books by Australian authors from 1st January, 2011 to 31st December, 2011.
International participants – Read at least 6 young adult books by Australian authors from 1st January, 2011 to 31st December, 2011. They can be old or new titles, however no re-reads. It is open to everyone. You don’t have to be a blogger but you MUST POST A REVIEW. I’ve had my copy of The Book Thief since 2007 and I still haven’t read it! I know that it’s really good, I’ve seen so many glowing reviews so I don’t understand why I haven’t picked it up. I enjoyed reading Saving Francesca so I can’t wait to read The Piper’s Son. I’m so glad it’s going to be internationally available soon. I will be getting copies of the last four books in the list from a friend who’s coming home from Australia. Yay, so excited to get them. Aussie books are really expensive but at least I won’t have to pay for shipping. That’s it for my starting post for this challenge. What about you, any Aussie titles that you’re planning to read next year? Oh – yay for joining! and how much do i love your picks for the challenge! you’ve listed all my fave authors! and – I know! our books are so expensive. what is with that? most paperbacks are pretty much $20. occasionally you can get them for $16 AU. Nomes, most of the books on my list are there because of your glowing reviews! 🙂 I don’t know if it’s a good thing that I follow several Aussie bloggers because I keep wanting to get so many Aussie books. Good thing my friend is coming home from there, otherwise, I don’t know what I’d do. I really don’t know why books over there are so expensive. The paperbacks cost just as much as US hardcovers. Thanks for signing up! You have some of my favourites on your list like The Piper’s Son, Good Oil, Raw Blue (okay most of the list). Look forward to your reviews! Thanks for hosting the challenge! 🙂 I’m so excited to read the books in my list. I’m actually jealous of Aussie YA nowadays because I’m hoping that Filipino YA will be just as awesome in the near future. I would be interested in reading Filipino YA. Is there much out there at the moment? Not much! I’ve only read one Filipino YA novel this year – Tall Story by Candy Gourlay and that one is available internationally because it has a UK publisher. Most Filipino books are compilations of short stories, there aren’t a lot of novels out there. I don’t know why. Maybe it will start to grow like the Aussie YA market is. I will have to try and get a copy of Tall Story. It sounds interesting. You had that on your favourite debuts? I’m really hoping it will! I don’t understand why Filipino writers aren’t writing more YA books when there’s such a demand for YA right now. Foreign YA books are selling like hotcakes.